Last year, when Verizon Wireless and Comcast were trying to get lawmakers to sign off on a giant wireless spectrum sale/noncompete pact, the two companies also said they were going to create a technology/R&D joint venture. It was supposed to come up with really cool tech products that consumers would love. That JV is now dead. Verizon announced its demise today during the company’s earnings call, but said the partnership actually ended in late August. The news here is that the most important part of the Comcast/Verizon deal hasn’t changed. Verizon still owns valuable spectrum it purchased from Comcast, and the two companies are still agreeing not to compete – or at least not to compete very vigorously. It’s not surprising that Comcast and Verizon have concluded that their JV didn’t make sense. Most JVs don’t. And if there is an example of two companies at the scale of Comcast and Verizon successfully working together to create cool consumer tech, I’d love to hear about it. For the record, though, the two companies didn’t seem to have those doubts back in March 2012. Back then, when the companies were still trying to get federal approval for the deal, they were pointing to the JV as a big win for consumers. If you’re a skeptical person, you might think that Comcast and Verizon were overselling the benefits of the JV from the start. You might think that they never really thought they could successfully compete with the likes of Apple and Google, but were holding out the idea because consumer groups were unhappy with the other parts of their pact, which seemed likely to reduce competition between the two companies. So, if you were a different kind of skeptical person, you might think that Comcast and Verizon really did think they could successfully compete with the likes of Apple and Google. And the fact that it only took them 17 months to realize they were wrong – and pull the plug – is a good thing. Oculus VR CEO Brendan Iribe pledged today that the company’s upcoming virtual-gaming headset, the Oculus Rift, will not cause people to get motion-sick when it launches. And that still-unannounced consumer launch date definitely won’t be in 2013, Iribe noted. Iribe, who appeared at D: Dive Into Media in February, discussed “The Future of the Rift” at the Gaming Insiders Summit today in San Francisco. He said the combination of improving screen quality and decreasing latency between motion in the game and virtual-reality vision will make the new class of games – or at least the ones not designed to cause motion sickness – nausea-free. The CEO used his own experience to back up the claim: His own company’s previous hardware made him sick within two minutes, every time he tried it in the past. 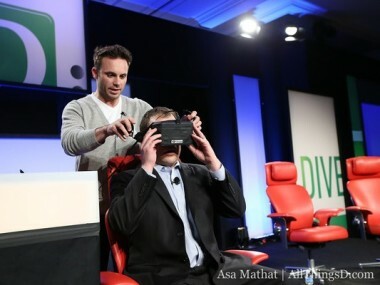 But with the latest internal build of the Oculus Rift, Iribe said he played for 45 minutes straight with no issues. Iribe also dropped two new notes about the Rift’s use cases: The headset will eventually have a 4K display, and it might work with big gaming consoles, as well as with PCs and mobile devices. There’s no technical reason that the Rift can’t work on consoles. It has standard input/outputs, it wouldn’t be a lot of work. It’s just a matter of console manufacturers deciding to license it as a peripheral. They’re the gatekeepers. 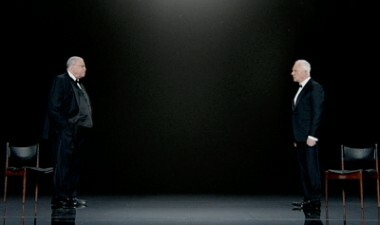 While you kind of feel badly for them, James Earl Jones and Malcolm McDowell manage to still look classy in the new Sprint commercials, in which they emote on a phone call and, in another, on Facebook updates for someone named Jenna. “I think I see you. Nope, wasn’t you,” booms Jones, who has most memorably been the voice of Darth Vader in the “Star Wars” films, among other big roles. Continuing its trudge toward becoming a more media-centric service, Twitter on Tuesday announced a new version of its iOS and Android mobile applications, giving more prominence to photos and video in the stream. Instead of needing to click through to see an attached photo in your Twitter timeline, now users will see previews of pictures and videos captured with Vine within the stream as they thumb through it. It’s a simple yet logical move for the microblogging service, which until now has primarily been relied upon for text-based updates in real-time. With the rise of Instagram over the past few years, users have flocked to more visual platforms, preferring to thumb through images and videos. The move comes as Twitter aims to broaden its appeal to users, only weeks before the company makes its public debut on the New York Stock Exchange. While practically ingrained into the mainstream media consciousness, Twitter’s user growth rate has slowed year over year; the company is home to around 230 million monthly active users, far short of Facebook’s billion-plus member network. Facebook’s acquisition of Instagram did not help matters for Twitter. The microblogging network was in fierce competition with Facebook to acquire Instagram just a few years ago, but lost out to a last-minute billion-dollar offer directly from CEO Mark Zuckerberg. As a result, Instagram later rescinded the ability to preview its photos from within the Twitter stream, requiring users to click an extra link in order to reach the Instagram shots. 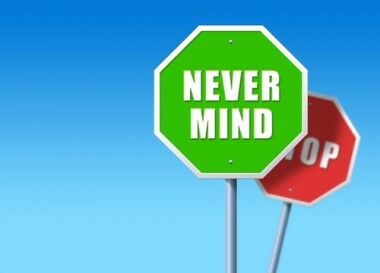 Not only was it annoying for users, it was a blow to Twitter, which lost a great deal of rich visual content. Shortly after Twitter received the heads-up late last year that Instagram would cut off its integration, the company scrambled to figure out a solution to bringing filters into the Twitter app itself, according to sources familiar with the matter. To do that, Twitter contracted the services of Aviary, an outside company responsible for much of Twitter’s photo filter product. Twitter certainly learned from the whole situation. What you won’t see are previews of photos uploaded from nonTwitter products; only photos uploaded via Twitter’s apps and services will show up in preview form. Same goes for Vine videos (but not for YouTube videos). No word on whether that will change in the future. Expect the download to roll out for Android and iPhones on Tuesday. This new iPad isn’t a radical rethinking of what a tablet can be, but it’s a major improvement on a successful product. It is the best tablet I’ve ever reviewed. … The battery performance of the iPad Air simply blew me away. The iPad Air is noticeably lighter than its predecessors. If you are the least bit interested in the new tablet computer from Apple, you probably already know that. The company’s engineers shaved just short of a third off the weight of the earlier version; the 9.7-inch Air weighs only a pound. What you may not know is this: Those 6.4 ounces make all the difference when, as you recline while reading or watching a movie, you conk out and the iPad falls forward to bonk you on the nose. The Air won’t hurt you the way the old iPad did. I’ve been using the iPad Air, which goes on sale Nov. 1, for a week now, and it’s hands-down the best tablet on the market. Apple has recrafted the hardware and packed in new software and services that make it more useful for creating content, not just consuming it. … Not that long ago, the iPad so dominated the tablet market that it would have been unthinkable to buy something else. With the rise of quality tablets from Google, Amazon and others, it’s no longer the only choice. But it’s still the best choice. This is the iPad that Apple likely wanted to launch on day 1, it just took a bit over three years to get here. … The iPad Air is the most significant upgrade to the 9.7-inch iPad in its history. It’s lighter, more portable, more usable and faster than any previous iPad. It doesn’t fundamentally change what you can do with a tablet, but if you’re in the market for one the iPad Air really is the best iPad to date. Competition is definitely more stiff among the smaller tablets thanks to the Nexus 7, but in the nearly 10-inch tablet space it seems like Apple is going to continue to enjoy a great position there. It’s only when you get hold of an iPad Air that you realise how well Apple has crafted this device. It’s lighter and the internals are faster. Add in the free software, and it has raised the bar on what you can do out of the box with a tablet. The iPad now isn’t just something to do a few functions around and about. It’s a device to replace your computer for almost everything. … This latest full-size Apple tablet is the most tempting iPad yet, better than its already best of breed predecessors, superior still to each and every rival big screen slate that I’ve tested. Apple dominates the tablet apps ecosystem. Its tablet remains the easiest to use. Functionally, the iPad Air is nearly identical to last year’s model, offering only faster performance and better video chatting. But factor in design and aesthetics, and the iPad Air is on another planet. It’s the best full-size consumer tablet on the market. To me, the comparison that is most interesting is to that of my MacBook Air. In exactly three years, Apple has produced an iPad that outperforms a then-brand-new MacBook. Three years is a decent chunk of time in this industry, and the MacBook Air has made great strides since then, but this (a brand-new iPad Air versus a late 2010 MacBook Air) is a credible comparison. In many ways the iPad Air is not just the superior device, but clearly so – it has a retina display, the MacBook Air does not; it gets 10 hours of battery life, the MacBook Air was advertised at just 5 hours back then (and as an old and much-used device, my personal MacBook Air gets significantly less than 5 hours of battery life today). Surprise: The iPad Air is the best iPad we’ve reviewed. In addition, though, it’s also the most comfortable 10-inch tablet we’ve ever tested. Not every manufacturer can produce a thin and light device without also making it feel cheap or flimsy, but Apple nailed it. Factor in a sizable boost in performance and battery life, and the Air is even more compelling. The last two iPads served up relatively few improvements, but the Air provides people with more of a reason to upgrade or even buy a tablet for the first time. The iPad Air is the no-compromise tablet. Beautiful display, crisp design, premium build quality: It’s the gold-standard by which tablets are judged, and rightly so. If Apple’s full-sized slates had fallen into the shadow of their mini brethren over the past twelve months, the iPad Air brings the larger tablet right back into the spotlight. The iPad Air is a huge improvement over the iPad 4th-gen, or the iPad 2. … Its form factor is the best currently available for a 10-inch tablet, and it provides a great blend of portability and usability that leans towards the media device end of the spectrum. With the iPad Air, Apple has created the world’s thinest and lightest full size tablet. And by adding their 64-bit A7 processor they have made it extremely powerful as well. After using the iPad Air for the past week I’m convinced that the iPad Air is the perfect personal computer for the masses. At $500, an iPad probably doesn’t need replacing every year or even every other year; if you have a 2012 or 2013 model, stick with what you’ve got. On the other hand, you’ll find the Air a fantastic leap into the future if you’re upgrading from an original iPad, or if you’ve never owned a tablet before. Right now, Snapchat is having its “belle of the ball” moment. The mobile messaging service – which lets users exchange photos and video that disappear after a few seconds – is being courted by Facebook. It has long been an app that CEO Mark Zuckerberg lusted after. Thursday afternoon brought another turn of the screw. Valleywag reported that Google could also possibly be considering taking a run at Snapchat, matching Facebook’s $3 billion to $3.5 billion offer. Google and Facebook aren’t commenting, but sources said that Google has indeed expressed some interest in a deal. Tencent, the Chinese consumer Internet company, has also been eyeballing the company, according to sources. I don’t know Snapchat’s fate, and from what I’ve been told, Snapchat CEO Evan Spiegel himself is unsure of it. But it got me thinking – whether they’re in the running or not, which companies are most likely to go after the fast-growing Snapchat? Let’s go down the list. Zuckerberg wants Snapchat bad. So bad, in fact, that he tried – and failed – to clone the app outright. Sources familiar with the matter have described the Facebook CEO as “obsessed” with Snapchat and the idea of ephemeral messaging. They told AllThingsD that he has made multiple offers to acquire the company, some for more than the $1 billion he paid for Instagram last year. Google may have Google+, but it knows it can’t hold a candle to Facebook or even Twitter when it comes to social mobile apps. Buying Snapchat could give Google immediate overnight relevance in social, while simultaneously dealing a blow to Facebook. Not to mention that $3 billion is a pittance for the highly profitable company to spend on an acquisition. This is a good fit. Spiegel has described Tencent as a “role model” for Snapchat in terms of revenue models – potentially alluding to in-app purchasing possibilities for the startup. And Tencent is indeed interested – if not in a full acquisition, then at the very least in a large strategic investment. A dark horse, and at this point not an entrant as far as I’ve heard. Still, CEO Marissa Mayer has the cash to make the deal, and is no stranger to acquisitions. Plus, an acquisition of Snapchat could help to both bolster Yahoo’s mobile efforts – which are lacking – and burnish its less-than-cool image – sort of like buying Tumblr did. Still, there’s no evidence to my knowledge that Yahoo has approached Spiegel or Snapchat about a potential acquisition. After long considering killing off its direct-messaging feature entirely, Twitter woke up last year and figured out that people actually love sending private messages. Another satellite app acquisition – similar to the one it did with Vine – could make sense. Problem is, the figures being thrown around for Snapchat now are way out of Twitter’s price range. They’re nearly double the amount the company just raised in its initial public offering. At this point, Snapchat is far too rich for Twitter’s blood. A caveat to many of the past week’s stories on this topic: It’s possible – if not likely – that the escalating prices and number of companies involved is largely due to jockeying from Snapchat insiders who stand to make hundreds of millions on the deal. Read each new report with that in mind. Another thing to remember: Spiegel intends to raise yet another round of funding for his company at a hefty valuation. If another round goes through, there will likely be a secondary component to it, in which Spiegel and co-founder Bobby Murphy could sell some of their own shares and cash out. That means the two could still continue to go for broke and build out their own company rather than sell to the highest bidder, while having the insurance of already having taken some money off the table. And according to multiple people close to Snapchat, Spiegel and Murphy very much want to build out the startup into a full-fledged company. Bottom line: If Snapchat keeps growing – and sources said that is indeed the case – Spiegel isn’t under the gun to make a decision today. If all goes well, his acquisition offers – and the high prices they command – likely won’t disappear. Netflix’s Q3 numbers are what Wall Street was looking for: The company now has 31 million subscribers in the U.S., and another 9 million in the rest of the world. Investors, who either hate Netflix or love Netflix but never feel neutral about it, are pushing the stock up 10 percent to $390 – an all-time high. Given that Netflix was trading in the $50s just a year ago and is basically the same company plus a few new original shows, it might be useful to have some perspective on the disconnect between the company and its stock. In calendar year 2003 we were the highest performing stock on Nasdaq. We had solid results compounded by momentum-investor-fueled euphoria. Some of the euphoria today feels like 2003. Despite the huge swings in our stock price since our 2002 IPO ($8 to $3 to $39 to $8 to $300 to $55 to $330), we’ve continued to grow our membership every year fairly steadily. We do our best to ignore the volatility in our stock. The progress we’ve made over the last 10 years is stunning. We want to make the next 10 years even more remarkable. Okay: On to the company itself. As many of my colleagues have noted, Netflix now has more paying subscribers in the U.S. than Time Warner’s HBO – or at least the last numbers that HBO reported. Unlike previous comparisons some of my colleagues have made between Netflix and, say, Comcast, this one is relevant, since Netflix and HBO are actual competitors who make roughly the same amount of money per paying subscriber. But as both Netflix and HBO have noted in the past, there is a high degree of overlap between HBO and Netflix subscribers: If you have one, you’re likely to have the other. Meanwhile Netflix, which sort of suggested last quarter that its “Orange Is the New Black” show was doing really well, is much more explicit about it this time around. The company specifically calls out the show as a great marketing device: “[G]reat press coverage and social buzz generated by” OITNB, as well as the company’s Emmy nominations, helped push up the company’s numbers in the U.S. But at the same time, Netflix also argues that people spend most of their time on the service watching stuff that isn’t made just for Netflix. Specifically, Netflix calls out shows like “Breaking Bad” and “The Walking Dead,” where it offers exclusive access to reruns; it says those kind of shows generate “a bigger percentage of overall Netflix viewing.” Which makes sense, because my hunch is Netflix spends more on those kind of shows (for now) than it does on its originals. But that’s a pretty good summary of the Netflix strategy right now: Use its original shows, and the attention they generate, to help sell the service to new users, and use TV’s reruns to help keep them. Looks like it’s working pretty well, regardless of stock price.